Rebellious visual artists have always given the world of cinema a distinctive aesthetic. Experimental films, therefore, continue to help cinema remain an art in itself. 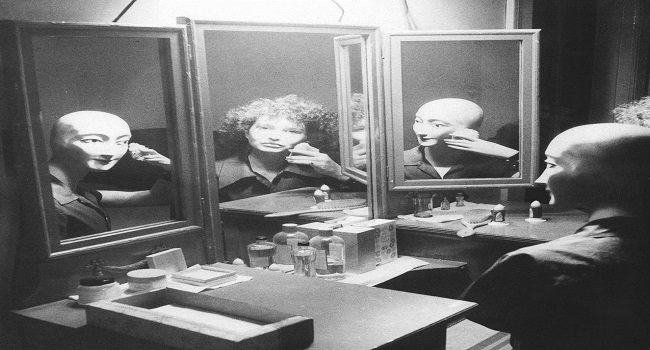 In an age when Hollywood was producing large scale films with clear narratives, directors like Maya Deren persistently created films which knocked audience off-balance and often left them uncomfortable and restless. She gave birth to a sect which cultivated the avant-garde genre within American. While her mode of expression was essentially surrealist, thematically her films can be divided into two broad categories: those which bordered around social-psychological phenomena and those which were a tribute to pure art. The films Meshes of the Afternoon (1943), At Land (1944) and Rituals in Transfigured Time (1946) fundamentally deal with life in general: be it socio-political, cultural, psychological or spiritual. Deren conceived and co-directed Meshes of the Afternoon with her second husband, Alexander Hackenschmied (later Hammid), when the Second World War was at its peak. For a woman who had been actively involved in politics, as a member of the Trotskyist Young People’s Socialist League in France, it was no surprise her first movie reflected her reactions to a society divided by war. The title Meshes of the Afternoon alludes to the lengthy series of random events in the film. The story follows a woman carrying a flower as she enters a house only to find the telephone off the hook and a knife on the dining table. As she proceeds through the house, stopping a playing phonograph in the process, the woman falls asleep on the sofa and, while dreaming, sees herself chasing a hooded figure with a mirror for a face. The same sequence is repeated, with slight variations entwined each time. The repetition and general lucidness of the film evokes a dream-inside-a-dream feel. Deren’s film is reflective of the burgeoning distrust in the atmosphere. The crucial sequence comes when the three replications of the woman sit together around the dining table with the fourth being the spectator. In the scene the key turns to a knife on the blackened palm of one of the replicas. It is at this moment, signaled by the look in her eyes, that the insinuation of darken and violent days ahead becomes clear. This dreamy projection of both the conscious and unconscious female is touched on again in At Land. Like a fish washed up on the shore, a woman is brought to land by the mighty waves of the sea. Apprehensive of the newness, she encounters the ephemeral and pretentious moments of life along her travels. This film, too, is yarned in the quintessentially Derenian style: disjuncture in space and time between shots, cyclical sequences of events, and multiplying selves. At Land serves as a commentary on the ways society attempts to confine women into specific roles. The shot of the woman running away, while victoriously holding the queen from a chessboard, is how Deren, perhaps, foresees the emancipation of women from both the facades and unfair realities of life. 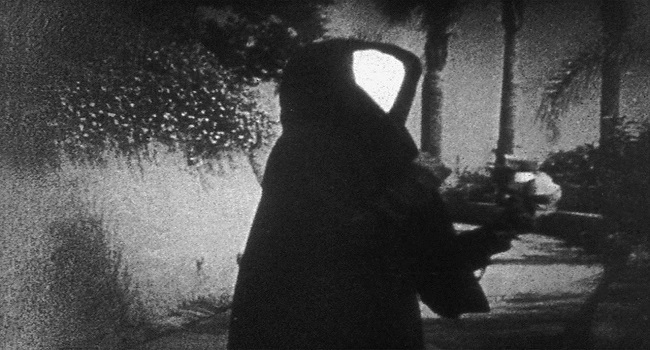 In Rituals in Transfigured Time, the ritualistic nature of life gets filtered through Maya Deren’s surreal lens. The film begins with Deren engrossed in the ritual of unwinding wool from a loom. Rita Christiani finds her in a moment of enchantment and is compelled to help Deren. The narrative then connects the wool spinning ritual with that of social gatherings and parties. In a time loop, we see Christiani turning to a nun and then again to an ordinary woman who greets the people at the party. 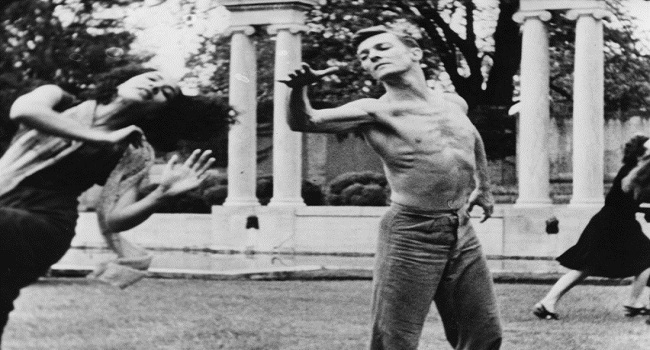 The remainder of the film includes shots of a garden-like space, Christiani dancing ecstatically with a partner, and a sculpture coming to life and chasing Christiani. The last shot is a symbolic image of a woman unveiling herself under water. 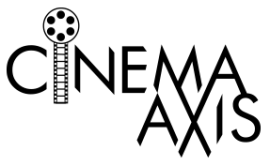 The film is full of freeze-frames and the scenes of the party are repeated numerous times from varying angles. Through these techniques Deren shows that freedom of expression, even with the fear of rejection, can still exist within ritualistic practices. It is also important to note that Deren worked under Kathrine Dunham, an African-American dancer/choreographer, before she started making films. It’s believed that Dunham’s influence – she exposed Deren to the metaphysical transcendence in ritualistic and iconographic elements of Haitian culture – helped to shape Deren’s approach to the subject. The films of this period, A Study in the Choreography for Camera (1945), Meditations on Violence (1948), The Very Eye of the Night (1958), celebrate the art of bodily movement. They are more free-flowing in nature and uninterrupted by dramatic moments. Being a dancer herself, Deren’s comprehension of the power of dance, as a transcendental and spiritual force, comes forth in A Study in the Choreography for Camera. She uses her camera incisively to create a dance film not bound by spatial limitations. Dancer Talley Beatty, with his deft bodily movements, glides from a natural setting in the woods to man-made spaces and back to nature again. As in her previous films, Deren uses straight cuts and intentional jump cuts, though masterfully, without inhibiting the flow of the dance. Despite the poetic beauty of films such as The Very Eye of the Night, more on that film later, it’s Meshes of the Afternoon that remain canonical among all her films. It is the film that pushed cinema to the edges of experimentation and proved that American short films could rival the work that Bunuel and Dali were crafting in Europe. Shot with a 16 mm Bolex camera, which was still a novelty then, the film won the Grand Prix International award in the Cannes Film Festival in 1947. 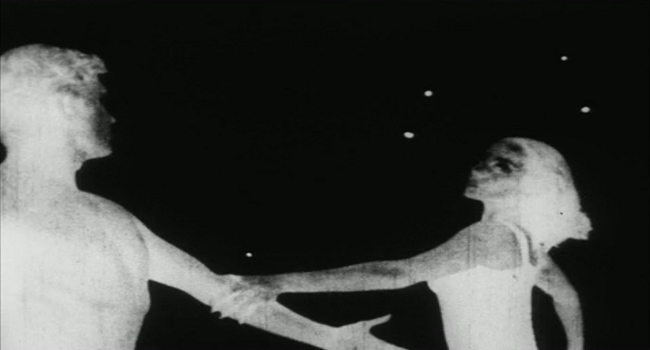 In Meditations on Violence Maya Deren aims to show that creativity is the essence of humanity. 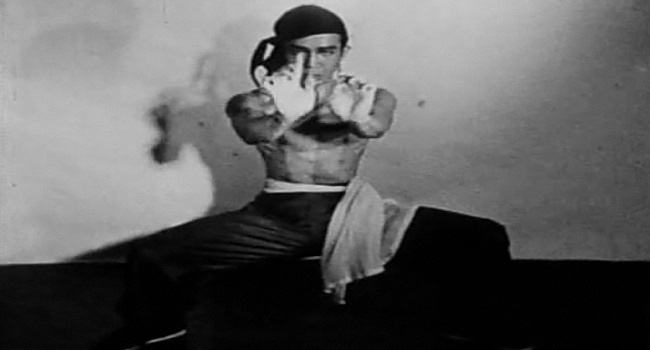 Through the dance-like motions in the Wudang martial arts, and by switching the music between Chinese flute tunes and Haitian drums, the film portrays the sacrosanct aspects of violence that people have learnt for self-defense. Wudang artist Chao-Li-Chi does a fabulous job in the film; he gives added resonance to Deren’s observations of the way creativity and violent movements can evoke beauty when paired with nature. However, it is The Very Eye of the Night which, despite being misinterpreted in subsequent years following its release, for me, that is her truest and most beautiful homage to art. It was shot in collaboration with the Metropolitan Opera Ballet School. The film is a magical portray of dancing figures gliding across the night sky. Full of twinkling stars, and accompanied by Teiji Ito’s visionary music, this film cannot be reduced to any social or psychological representation. It’s pure art and Deren establishes herself as the poet of cinema through this film. Trance films are a rarity in the world of cinema; not all directors trying their hands at it can pull it off as phenomenally as Maya Deren did. It was her whole personality which often reflected in her films: the reflective woman, the poet, the photographer, the dancer, the film theorist. She was also an exceptional film theorist with a spectacularly unique take on cinema as an art form. Besides being a champion of independent films, Deren also authored the essay An Anagram of Ideas on Art, Form and Film, which is a must read for anyone seriously interested in cinema. Though Deren made silent movies, her films received beautiful music from Teiji Ito, her third husband, after her death. Ito’s music infused an enchanting allure into a film which was already quite magical. Unlike many films that use props to complement the storytelling, Deren’s films are metaphors in themselves. Time-lapse photography, superimposition of images, continuous rhythmic movement through sporadic frames are staples of her works. In 1946 Deren became the first artist who received the Guggenheim grant for creative filmmaking. She used the grant judiciously to make Meditations on Violence and for her research on Voudou ritualism in the Haitian society. Her book, Divine Horsemen: the Living Gods of Haiti (1953), is a monumental work in the history of anthropological studies. If she had lived longer, Deren died in 1961 at age 44, she might have finished some of her incomplete films like The Witch’s Cradle, Medusa, Season of Strangers. 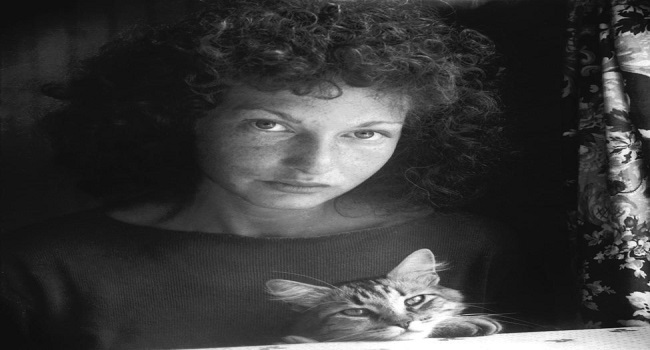 In Martina Kudlacek’s exquisite documentary on Deren’s life, In the Mirror of Maya Deren, she claims that the hemorrhage which caused Deren’s death was due to extreme malnutrition and long time dependence on drugs, a direct contrast to the popular claim that Deren as a result of a voodoo curse. An important figure in the history of film, Deren never could have imagined the profound impact that her surreal and groundbreaking work would have on the cinematic landscape. I had never heard of her before. Thank you so much for having written about her work. It’s great to learn about a real pioneer. Thank you for reading. Her works are really inspiring for ones who are keen on making art films.